Very few things can make me manage a smile at 6AM. Giant Salamander is hunting one such thing. 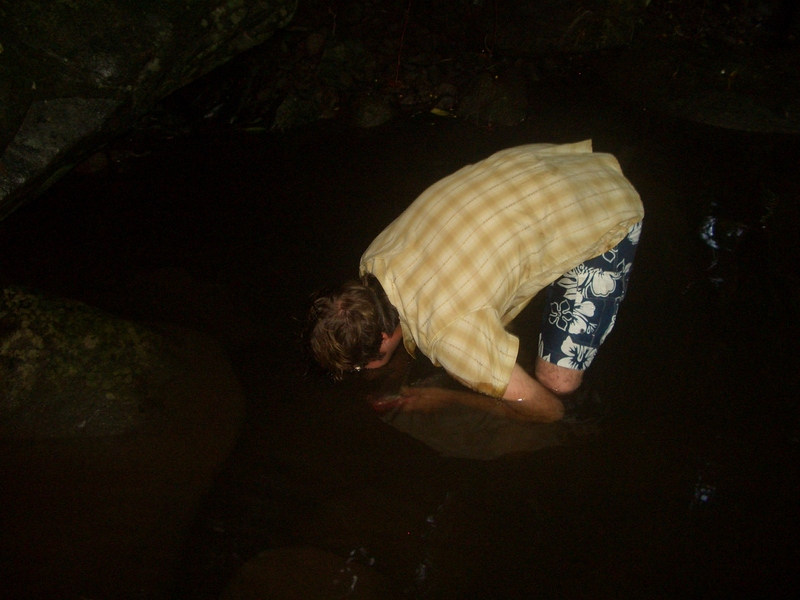 We got up at about 5:30AM and immediately resumed searching for Giant Salamanders. The river was noticeably lower and a bit more clear than it was the previous day. Apparently it had been swollen from the torrential storm that hit the area a few days prior. We searched downstream of the site for about 3 hours before returning to the tent to eat a breakfast consisting of anpan, oranges, dried-meat, green-tea and coca-cola. 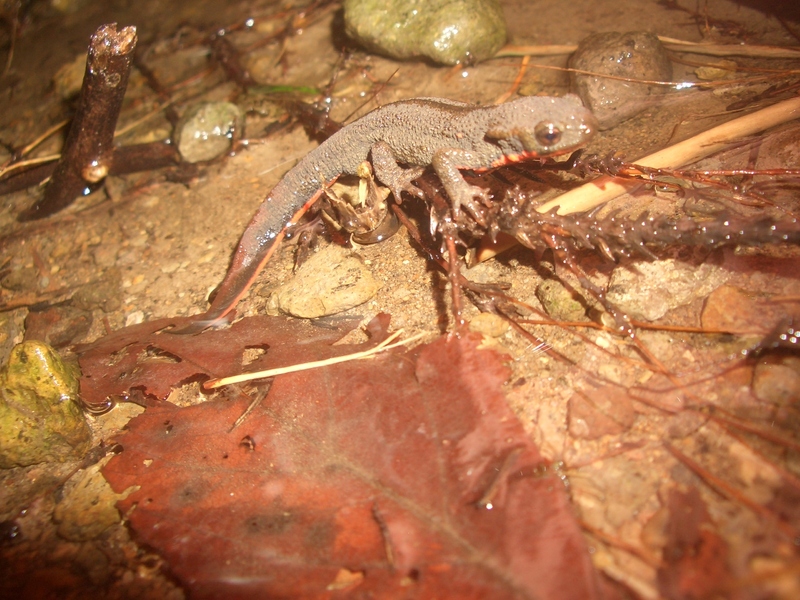 On the forest floor near the tent, we found Cynops pyrrhogaster Japanese Fire-Newt/イモーリ(Imoori). As a child, I had seen these many times in pet-stores and in Innai we had seen a few splattered on the road, but seeing a live one in-situ brought me the amount of joy roughly equivalent to consuming a bucket of KFC. Cynops pyrrhogaster: About $5.00 a pop in pet-stores but awesome nonetheless. We returned to the river by 9:00AM and resumed the search. 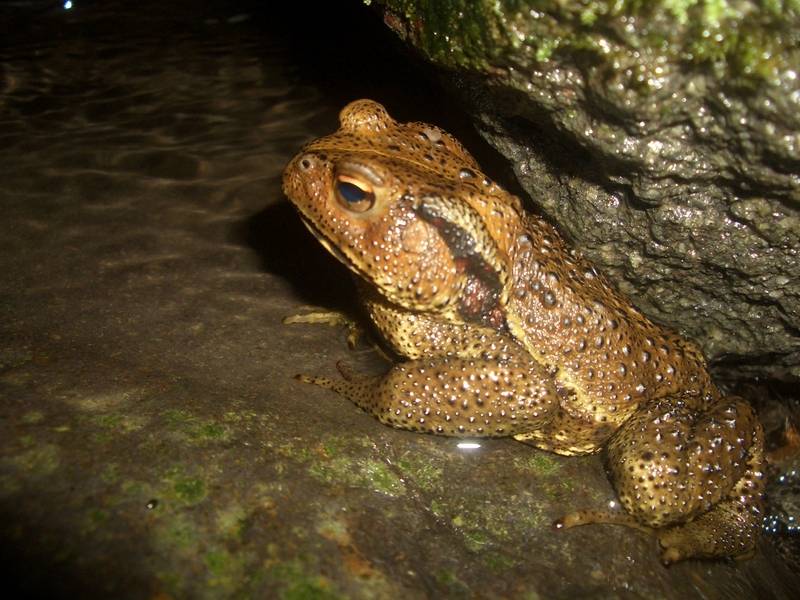 Continuing upstream, we came across a huge Bufo japonicus Japanese Toad/ヒキがエル(Hikigaeru) sitting on a boulder in a zen-like manner. This was easily the largest B.japonicus I’d ever seen firsthand. 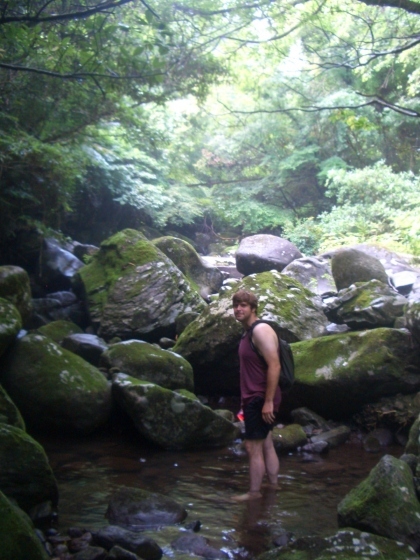 While I was climbing up a small waterfall, a boulder dislodged and rolled backwards carrying me with it. In that instant, I wondered whether I was about to be pinned under water or have my head cracked open on a rock. The answer was neither. When it stopped, it was on top of my legs, but I had been spared of having any crushed bones thanks to a gap in the rocks. I heard my partner yell “Oh my God! I’ll never get that off you!” I sat up and, with panic-induced andrenaline-fueled idiot-strength, pushed the thing off of myself. My already-injured foot had taken the worst of it; it was bleeding a bit and it was obviously going to have some major bruising, but I could still walk on it. About 5pm, we walked (limped in my case) back to Innai. Our first purpose was to find a bus stop and check the bus schedule because, planning ahead, it was pretty clear I wouldn’t be able to make the approx. 30km walk back to the train station in Usa in a timely manner. The second purpose was to get more junk food from the liquor store. However, after locating the bus stop, we found that that there would be no buses running in Innai for the next several days because they don’t operate when the local schools are closed. But on the bright side, we bought some bologna at the liquor store; bologna always makes traumatic near-crippling events better. This is pretty much what 90% of my day consisted of.